I tripped over the 23,000 Gamerscore mark yesterday. At least half of the latest thousand is down to Bully Scholarship Edition but I have been playing some other games as ... Read more..
I’ve been spending quite a bit of my time lately playing Bully Scholarship Edition. It’s not a title that I would have really considered buying myself but it came up ... Read more..
My copy of Wii Fit and the Nintendo Balance Board arrived on Friday. It is something that both my wife and I have been looking forward to ever since the ... Read more..
(Or should that be the Wii and I?) 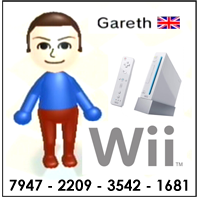 I was really excited when Nintendo announced the Wii, or the Revolution as it was back then. It's the only console I have ... Read more.. I hadn't intended to trip over the 22,000 Gamerscore mark last night. In fact I had a completely different blog entry planned for today, but a brief sojourn in the ... Read more.. I've murdered in Assassin's Creed. I've turned to the dark side in KOTR. I've been a thief in Oblivion and I've completely wiped out entire species of aliens countless times! ... Read more.. I've experienced several of Microsoft's Games for Windows Live titles. Indeed it was the first, Halo 2, that initially gave me a taste of the Gamerscore system. For a year ... Read more.. I was a little shocked to have hit 21,000 Gamerscore this morning, seeing as I only reached 20K a week or so ago. I guess I've been gaming more than I ... Read more..
As I'm getting towards the end of Lost Odyssey I decided to take a short break and spend some time on another game. I didn't want to go straight into ... Read more..